Tá an tseirbhís nuachta dhigitigh, Nuacht 24, beo faoi dheireadh, deirtear liom. Beagnach bliain ó shin ó fhograíodh go raibh an chonradh faighte ag Tomaí O Conghaile agus a cháirde i Fusion i mBéal Feirste, tá na deacrachtaí suntasacha a bhí acu maidir le cúrsaí éagsúla réitithe. Seo sampla thuas den chineál oibre a bheidh ar bun ag Nuacht 24 – scéal deas ag cur síos ar an obair mhaith atá á dhéanamh i gColáiste Feirste. Dream óg ag tabhairt an dráma iomráiteach, Dialann Anne Frank, ar árdán sa Baby Grand sa Grand Opera House i mBéal Feirste. Is maith liom na guthanna óga seo a chloisint ag labhairt na Gaeilge go nádúrtha, de réir a gcanúint féin. Níl aon náire orthu í a labhairt – a mhalairt glán, is léir go bhfuil siad bródúil aistí agus is dea theist é sin ar scoil ar bith. Iar scoláire de chuid Coláiste Feirste í Milene Fegan, laithreoir Nuacht 24, agus ar ndoigh tá sí tar éis go leor taithí iriseoireachta agus eile a bhailiú le Nuacht 24, an nuachtán, agus chomh maith le sin b’í Rós Bhéal Feirste ag Féile na Rósanna anuraidh. Beidh Tomaí O Conghaile, mo shean chomrádaí ag Lá Nua agus duine de na h-iriseoirí agus gniomhaithe is bisiúla sa tír, ina laithreoir freisin agus tuigim go mbeidh sean chomrádaí eile liom, Eoghan O Néill le feiscint ós comhair ceamra freisin. Tá sé de rún agam féin cúpla scannán a chur ina dtreo le féachaint an mbeidh spéis acu iontu – b’fhéidir go mbeidh tuairisc againn ar chuairt na bhFilí Albanacha go Múscraí ar Nuacht 24 amach anseo? Beidh le feiceáil! Más amhlaidh go dtarlaíonn sé sin, déanfaidh mé mo dhícheall mo phus gránna a choimead as radharc an cheamra! Mar is dual do mhuintir Bhéal Feirste, tá ceannródaíocht ar bun acu. Níl siad sásta bheith sáite leis an sean rud ach iad, ar nós criú an Enterprise, ag lorg domhan úr agus a leithéid. Go maire sé i bhfad – agus go raibh rath air! Live Long and prosper! Foilsiú: 19/04/2010 . igaeilge a d’fhoilsigh. Ranganna: An Ghaeilge, Cúrsaí Reatha, Cultúr. Clibeanna: Béal Feirste, Coláiste Feirste, Cuairt na bhFilí Albanacha, Milene Fegan, Nuacht 24, Star Trek, Tomaí Ó Conghaile. Tá scéal á thuairisciú ar maidin inniu a thugann mé ar ar thuras ar bhóithrín na smaointe agus a fhagann cheist san aer faoin dearcadh atá againn sa tír seo agus i dtíortha eile san Aontas Eorpach faoi saoirse an phreasa. Scéal é a thosnaigh go moch maidin Mhárta i mbaile beag tuaithe taobh amuigh de Donostia [San Sebastian] i dtír na mBascach. Ar aon nós, cuireadh ballraíocht d’ETA i leith an eagarthóra, Martxelo Otamendi, agus cuireadh eisean agus ceathrar eile faoi ghlas. Laochra saoirse an phreasa iad Martxelo, Iñaki Uria, Joan Mari Torrealdai, Txema Auzimendi agus Xabier Oleaga. Céasadh iad i bpriosún agus bagraíodh marú orthu. Scaoileadh saor iad tar éis roinnt míonna ach bhí na cúiseanna go fóill ina gcoinnibh. Dúnadh an nuachtán agus níor osclaíodh ó shin é.
Ach an lá tar éis don nuachtán Egunkaria bheith dúnta, bhí nuachtán eile Bascaise sna siopaí. Tá Berria ag dul ó shin – agus b’onóir domsa go raibh altanna liom sa dhá nuachtán. Is cás mór saoirse an phreasa an cás seo. Go bhféadfadh sé titim amach i dtír atá ina bhall stát den Aontas Eorpach go ndúnfaí nuachtán de bharr easaontas an Rialtais leis an nuachtán. Duradh gur ar bhonn an ‘chogaidh in éadan sceimhle’ a dúnadh Egunkaria, ach i bhfirinne ba bheart díoltais é an dúnadh in éadan pobal na Bascaise mar gheall ar bheartais ETA, amhail is go raibh an pobal sin ag tacú le ETA. 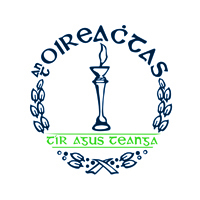 In ainneoin chomh mór is a bhí an chás seo ó thaobh saoirse an phreasa de, ba bheag tuairisciú a deineadh faoi i nuachtáín na hÉireann seachas i Lá. Na h-íomhánna a chonacthas, poilíní faoi phuicíní agus iad armtha ag druidim nuachtáin, chuaigh siad glan in éadan an tsoiscéal Eorpach a bhionn á chraobh scaoileadh ag na h-údaráis. Ní fhéadfadh a leithéid de rud titim amach anseo, an bhféadfadh. The ruling also points out that the closure of Egunkaria was “not directly covered by the Spanish Constitution”. “The mistaken vision that anything to do with the Basque language and all culture in that language must be being promoted or controlled by Eta leads to a mistaken interpretation of the facts,” the ruling continues to say. “It was clear from the newspaper’s editorial line that it did not follow Eta’s instructions”, it concludes. Is fiú go mór an chúntas seo a foilsíodh i Time i 2003 a léamh. First came the predawn trip, blindfolded in the back of a Spanish paramilitary van, from his home in Tolosa to a police cell in Madrid. It was there, claims Martxelo Otamendi — the last managing editor of the now banned Basque-language daily Egunkaria — that his ordeal began. While police interrogated him about his newspaper’s alleged links to the Basque separatist terror organization ETA, he claims they had him stand naked in his cell for three days, with a chance to sit down only every five hours. Otamendi, 45, says the police humiliated him for his homosexuality, telling him to “take the position I use when my lover and I make love.” On the third day, he says, they gave him the notorious treatment known as la Bolsa — “the bag” — a plastic sack pulled over the head to cause a panic they hoped would compel him to name his ETA contacts. But Otamendi insists he has none. His only relationship with the terrorists, he says, was several interviews conducted years ago. “There’s never been any suggestions from ETA to our paper, no orders, absolutely nothing,” he says. Otamendi’s explosive and still unproven story has been vociferously denied by the Spanish government. Nevertheless, the Feb. 20 closure of Egunkaria and the detention of 10 of its managers — five of whom remained in custody last week — have given fresh focus and energy to Basque feelings of martyrdom. A crackdown meant to weaken Basque national solidarity may have done the reverse. Is féidir libh teachtaireacht tacaíochta a sheoladh chuig Berria tre twitter. Is é #egunkarria an seoladh le h-úsáid sa teachtaireacht agus feicfear tú ar an bpríomh leathnach…. Foilsiú: 13/04/2010 . igaeilge a d’fhoilsigh. Ranganna: An Ghaeilge, Cúrsaí Reatha, Nuacht. Clibeanna: An tAontas Eorpach, Egunkaria, Foinse, Foras na Gaeilge, Lá, Lá Nua, Nuacht 24, Saoirse an Phreasa, Sinn Féin. 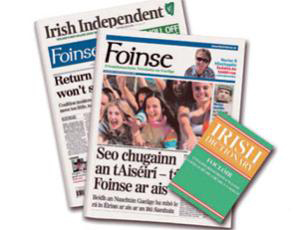 Cheannaigh mé Foinse Nua ar maidin agus fuair mé an Irish Independent saor in aisce in éineacht leis… Ní raibh aon fhoclóir Ghaeilge Béarla ann áfach. Iatán 24 leathnach tablóideach lán daite atá i gceist le dearadh snásta agus teacht i láthair taithneamhach. Is léir go bhfuil fios a gnó ag an Eagarthóir nua, Emer Ní Chéidigh agus tá moladh nach beag ag dul di as ucht an méid oibre atá déanta chun Foinse a fhorbairt agus aghaidh nua a chur air. Beidh aithne againn ar na pearsaí atá ag scríobh don nuachtán – leithéidí Daithí O Sé, Blathnaid Nic Donnchadha (Paisean Faisean) agus Gemma Ní Chionnaith (Anocht FM), Hector O hEochagáin agus Mícheál O Conaola. Glacaim leis gur scriobhnóirí rialta iad seo – ach tá dornán ainmneacha eile luaite leis an gcéad eagrán, ainmneacha a thugann le fios an meas atá ar Phádraig O Céidigh, foilsitheoir Foinse, i ndorchlaí na cumhachta. Uachtarán na hÉireann, Maire Mhic Giolla Iosa, An Taoiseach, Brian O Comhainn, agus, ar leathnach na litreacha, leithéidí Enda Kenny, Eamon Gilmore, Mary Kennedy, Máirtín O Muilleoir agus Peadar Mac Fhlannchadh – tá litir comhghairdis uatha san ar fad ar leathnach na litreacha. Tabhair faoi ndeara nach bhfuil aon litir comhghairdis ann ó phríomh fheidhmeannach Fhoras na Gaeilge, Ferdie Mac an Fhailigh. 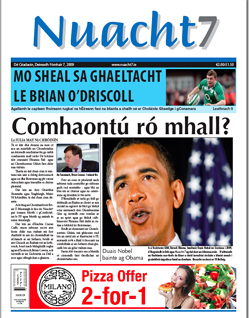 Is beag nuachta sa nuachtán nua. As an 24 leathnach, níl ach cúig leathnach nuachta ann agus tá colún Dhaithí Uí Shé faoi ‘Jedward’ maraon le focal failte ón Eagarthóír san áireamh ansan. Tá dhá leathnach eile le ‘nuacht’ mar cheannteideal orthu – ach anseo tá colúin ó Mícheál O Conaola (Cén baile is feiliúnaí don Oireachtas), athchúrsáil ar abhar Gaelport agus colún airgeadais. Tá tús áite tugtha d’agallamh leis an Aire Ghnóthaí Pobail, Tuaithe agus Gaeltachta, Éamon O Cuív, agus a gheallúint go bhfuil airgead na gColáistí Samhraidh slán ‘go foill’. Ní caineadh é sin, mar a cheapfá, nó níl sa nuacht ach gné amháin i bpacaiste iomlán nuachtáin an lae inniu, trath go mbionn an nuacht le fáil 24/7 ar an idirlíon. Tá ar ‘nuachtáin’ iad féin a chur in oiriúint don ré go bhfuil eolas ag an leitheoir ar an nuacht is déanaí ó fhoinsí eile roimh a shroicheann an nuachtán féin a lámha. Is athrú iomlán Foinse Nua ar an sean Foinse. In áit go raibh an sean Foinse tuatach agus sean aimseartha ina chur chuige agus ina dhearadh, tá Foinse Nua nua aoiseach agus snásta. An feabhas é seo? Braitheann sé sin ar do dhearcadh. Más leitheoir rialta an “Irish Times” tú, mar a mhaíonn go leor Gaeilgeoirí aitheanta agus iad á léamh i dteannta le latte na maidine, bhuel ní bheidh morán sásaimh anseo duit. Nuachtán é seo atá dírithe ar na scoileanna agus ar na bhfoghlaimeoirí Ghaeilge don chuid is mó – tá 10 leathnach nó 40% den nuachtán dírithe orthu san. Tá ceithre leathnach spóirt ann – san abhar seo tá aistriúcháin ar dhá leathnach d’ailt ó ghné scriobhnóirí an Irish Indo, Tony Ward agus Vincent Hogan. Arís ní miste sin – is úsáid mhaith é ar acmhainn an Indo agus ar ghnó an aistriúcháin. An eilifint sa seomra nach bhfeictear tagairt ar bith do sa nuachtán, an chinneadh atá le déanamh ag Foras na Gaeilge faoin chomórtas atá le déanamh ag bord na h-institiúide teanga tras teorainn Dé hAoine faoi na h-iarratasóirí ar an gconradh seachtainiúil a dhiultaigh Foinse i mí an Mheithimh. Ní h-é gur ligeadh i ndearmad é a lua, táim ag glacadh leis, ach fagann an t-easnamh maraon leis an liosta le h-áireamh de thacadóirí cumhachtacha atá bailithe ag an nuachtán, An Taoiseach, an tUachtarán, ceannairí an fhreasúra – ceist mhór san aer. An mbeidh an cnamh droma ag an bhForas leanúint leis an gcomórtas a thosnaigh siad – agus a chuir grúpaí isteach air le dóchas ionraic agus le h-uaillmhian measúil – nó an dtapóidh siad ‘deis’ gan leanúint leis agus na h-iarratasóirí a fhagail ar an dtrá folamh? Go deimhin ní doigh liom go bhfuil an Foras luaite olc nó maith san eagrán seo de Foinse. Ceapaimse go bhféadfadh nuachtán seachtainiúil Ghaeilge le cois Foinse bheith rathúil agus go mbeadh an nuachtán sin tarraingteach do lucht léite Foinse agus Lá Nua roimhe. Bheadh sé mar ‘bhreischéim leitheoireachta’ do lucht Foinse agus tá sé sin tabhachtach freisin. Creidimse go mbeadh an nuachtán atáim féin luaite leis, Nuacht 7, go maith ábalta an ról sin a ghlacadh agus go bhféadfadh sé tarlú gur mó suim na bpairteanna, má thuigeann sibh mé. Is deis é seo don Fhoras le tapú, má thapaíonn siad é. Ach d’fhéadfaí a rá faoin Fhoras an méid a duradh faoi John Bruton trath: dá mbeadh anraith sa bhaisteach, bheadh siad amuigh faoin chlagar le forc. Guím gach rath ar Foinse [Nua]. Is céim chun cinn é d’fhoilsitheoireacht na Gaeilge agus is maith ann é. Guím gach rath ar an Eagarthóir, Emer Ní Chéidigh, agus ar a foireann. Foilsiú: 18/11/2009 . igaeilge a d’fhoilsigh. Ranganna: An Ghaeilge, Cúrsaí Reatha, Cultúr. Clibeanna: Éamon Ó Cuív, Foinse, Foinse Nua, Foras na Gaeilge, Ní, Nuacht 24, Nuacht 7. Rás dhá chapall le h-aghaidh nuachtán seachtainiúil? An bhfuil sé tabhachtach go mbeadh an nuachtán seachtainiúil nua lonnaithe sa ‘Ghaeltacht’? Agus, má tá, an bhfuil sé tabhachtach go mbeadh an nuachtán sin suite i gConamara? 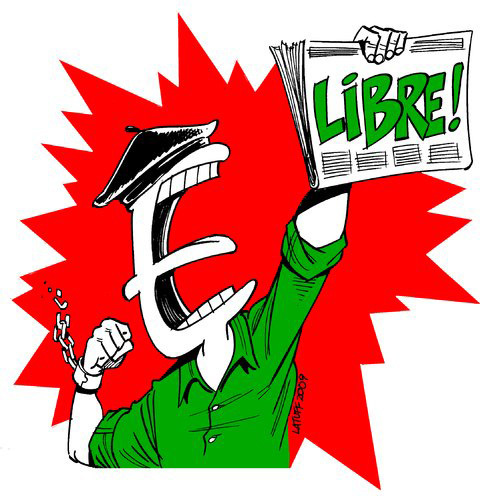 Ar an chúig iarratas, tá iarrataisí ó fhoireann Foinse, Nuacht 24, Bard na nGleann i Múscraí, Independent Free Newspapers (nach ionann agus Independent Tony O’Reilly) agus comh-iarratas ó Mháire Ní Thuathail is an Connacht Tribune. Dar le hAntón Mac Cába, an tuairisceoir a chuir an alt ar fáil don Post (tá sé Media and Marketing Section), is ag Nuacht24 agus Foinse atá an taithí is faide ó thaobh foilsiú nuachtáin Ghaeilge. Níl aon amhras gur ráiteas fírinneach é sin – cé nach gá gur buntáiste é.
Ach is é an ráiteas atá luaite le Seán Tadhg O Gsirbhí, iar eagarthóir Foinse, a thugann lón machnaimh an lae dom. De réir Seán Tadhg, mar sin, is é an príomh bhua atá ag a iarratas go bhfuil sé lonnaithe sa Ghaeltacht agus, ós rud é go bhfuil sé féin lonnaithe i gConamara, maraon le triúr eile, go bhfuil sé ‘ana thabhachtach’ go mbeadh an nuachtán nua lonnaithe ‘sa Ghaeltacht’. Tá amhras orm. Sa chéad dul síos, cén fath go bhfuil sé ‘an tabhachtach’ go mbeadh an nuachtán Ghaeilge suite sa Ghaeltacht thar aon cheantar eile? Ni chreidim é. Ar ndóígh ní mí bhuntáiste é bheith suite sa Ghaeltacht níos mó chomh fada agus go bhfuil ceangal maith idirlín agat. Is féidir leat teacht ar an nuacht agus, anuas ar sin, is féidir leat an nuachtán a sheoladh chuig an chlólann gan aon deacracht. An amhras atá orm go stopann an Ghaeltacht atá Seán Tadhg ag tagairt do ar an mbóthar go Bearna. Tá an meoin ‘Little Conamara’ go forleathan sa tír seo. Ní aithnítear aon ghaeltacht bheith ann seachas Conamara agus cúpla cúinne j dTír Chonaill is Ciarraí. Meoin treabhúil, tuathúil is tuatach é seo a fhagann go bhfuil ceannaras na bpríomh meán Ghaeilge suite i gConamara, mar atá TG4 agus Raidió na Gaeltachta. Agus tá an meoin tuatach sin le sonrú sna sceidil a chuireann an dhá mheán sin ar fáil dar liom. An pobal a labhrann Ghaeilge sa linn seo, is pobal cathrach é. Agus creidim go bhfuil gá le riar a dhéanamh ar an bpobal sin. Má léann an pobal cathrach an nuachtán nua, léifidh an pobal Gaeltachta é chomh maith. Mar teastaíonn ón pobal Gaeltachta bheith cosúil leis an pobal cathrach. Ar éigean go dtarlóidh sé ar mhalairt threo. Maith go leor, más é an príomh sprioc atá ag an dtogra seo ‘postanna a chruthú i gConamara’ nó, fiú, postanna an cheathrar a bhíodh ag obair ag Foinse a thabhairt ar ais doibh, ach an é sin sprioc an chomórtais? Nach é an sprioc atá ag an bhfiontar seo nuachtán nua a aimsiú a bheidh á léamh ag pobal na Gaeilge ar fuaid na tíre agus, go deimhin, ar fuaid na cruinne? Anuas ar sin, is é an sprioc ar cheart a bheith ag an nuachtán seo cuidiú agus spreagadh a thabhairt d’fhás phobal na Gaeilge seachas riar a dhéanamh ar phobal Ghaeltachta atá á chreimeadh i rith an ama ag iarrachtaí éagsúla chun ‘teorainneacha na Gaeltachta’ a ath-tharraingt. Ba i Foinse is mó a fuair an feachtas seo poiblíocht – agus ar ndóigh is é an toradh ar seo na moltaí i dTuarascáil Mhic Carthaigh atá bunaithe ar an mbun fhiric nár oibrigh na scéimeanna éagsúla chun tacú le labhairt na Gaeilge a spreagadh sa Ghaeltacht. Dar liomsa, tá an raiteas ó Sheán Tadhg dírithe go mór mór ar an bhagairt a fheiceann sé ó Nuacht 24 a chur ar cheal. Tá Nuacht 24 ag tairgeadh nuachtán de chaighdeán ard GAN AON CHABHAIR ón stát, thuaidh nó theas, agus is féidir a fheiscint dá bhfaigheadh an nuachtán sin tacaíocht d’aon tsort go mbeadh sé ar a laghad chomh maith is a bhí Foinse ar an lá is fearr ag an nuachtán sin. Tá níos mó ná dhá chapall sa rás seo, áfach, nó tá Bard na nGleann ó Ghaeltacht Mhúscraí, gaeltacht nár shíl Raidió na Gaeltachta gurb fhiú suirbhé éisteoirí a dhéanamh ann, agus Nuacht 24 ó Ghaeltacht Bhéal Feirste, nach n-aithnítear mar Ghaeltacht toisc é bheith taobh amuigh de na 26 contae cé go dtuigtear go forleathan go bhfuil pobal chomh Gaelach ann is atá in áit ar bith ar fuaid na tíre. Ni miste liom cé bhuann an chonradh seo – chomh fada agus go mbeidh an nuachtán buach ábalta agus toiltheanach dul sa tóir ar an líon is mó leitheoirí seachas riar a dhéanamh ar sciar bheag agus ar leith den phobal. Níor cheart go mbeadh toradh an chomórtais seo ag brath ar shuíomh an nuachtáin bheith i gConamara. Is iad dearcadh agus cur chuige an nuachtáin na treithe ar cheart díriú orthu. Os rud é go bhfuilim ag tabhairt rás capaill ar seo, ní fheadar arbh fhiú dul go dtí Paddy Powers agus fiafraí do cé acu an bhfuil sé sásta geall a ghlacadh mar gheall ar an dtoradh…. Foilsiú: 14/09/2009 . igaeilge a d’fhoilsigh. Ranganna: An Ghaeilge, Cúrsaí Reatha. Clibeanna: Foinse, Foras na Gaeilge, Nuacht 24, Nuachtán Seachtainiúil. Tá ‘G-spóireacht’ ar siúl anocht ar an gCeathrú Rua faoi mholtaí Thuarascáil Mhic Carthaigh agus na h-impléachtaí don Ghaeilge agus don Ghaeltacht. Ní olc an rud é sin agus dá mbeadh deis agam, d’imeoinn ann. Tá tuilleadh eolais ar fáil anseo…. Is maith ann an diospóíreacht seo agus tagann sé leis an méid a deir Breandán Delap in alt bhrea ar Beo.ie na míosa seo chaite faoin úsáid atá á bhaint as an eigeandál eacnamaíochta seo chun tabhairt faoin chaiteachas ar an nGaeilge is ar an nGaeltacht. Creidim go bhfuil an ceart ag Breandán nuair a thugann sé le fios gurb ionann agus an Nollaig ag cuid againn blianta an Tiogair – bhí an t-uafás airgid á chaitheamh ar aistriúchán na gcaipédsí Stáít agus níl deireadh leis an gcaiteachas sin go fóill. Dá dtagadh an Ciste Idirnáisiúnta Airgeadais in áít an Rialtais, cheapfainn gurb é seo an cineal caiteachais a chuirfí deireadh leis láíthreach. Cad is fiú bheith ag aistriú caipéisí oifigiúla go Gaeilge mura bhfuil ach an dornán is lú daoine á léamh? Ach seo sinn anois – ag fánúint ar phlean atá le foilsiú uair eigean agus níl a fhios againn cén uair nó ní ionann an tuiscint atá ag an Aire ar sprioc am is atá agamsa nó agatsa. Tá an comhthéacs athruithe go h-iomlán ag Tuarascáíl McCarthy agus mura n-aithnímíd é sin anois agus dul i ngleic leis i slí atá ciallmhar, is measa dúinn a bheidh sé. Luaigh sé freisin caint a thug an Dr. Eoin O’Malley inar cuireadh Acht na dTeangacha Oifigiúla sa réimse céanna agus na h-innil votála leictreonacha atá taréis na milliún a chosaint orainn agus gan aon rath faighte againn uathau. Cuirim le sin alt amháin eile, a fhoilsíodh sa Sunday Independent ag an deireadh seachtaine, ón Dr. Colum Kenny, léachtóír i bpolasaí theilifíse ag DCU agus namhaid seana bhunaithe do bhunú TG4, fear a raibh mé ag diospóireacht leis uair nó dhó roimhe seo, agus an port atá á thuairisciú aige siúd go mbeidh na seóanna is fearr ar RTÉ thíos leis má thugtar sciar d’airgead an cheadúnais do TG4 mar atá molta ag Tuarascáíl McCarthy. Ar ndóigh is é TG4 – agus níl sé gan locht – an seod Gaelach. Dá bhfaighfí reidh leis, buille mór a bheadh ann do shaol na Gaeilge cé nach buille marfach a bheadh ann i bhfianaise an spioraid atá léirithe ag lucht nós* agus Nuacht 24, tionscnaimh tuaisceartacha, le tamall anuas. Tá gá le ‘G-spóireacht’ agus tá súil agam go mbeidh sé de acmhainn ag lucht riartha na diospóireachta anocht míreana a thaifeadadh agus a chraoladh ar an idirlíon sna laethannta romhainn. Beidh orainne freisin tosnú ag reachtáil ár gcuid diospóireachtaí féin…. Foilsiú: 05/08/2009 . igaeilge a d’fhoilsigh. Ranganna: An Ghaeilge, Cúrsaí Reatha. Clibeanna: An Bórd Snip Nua, Beo, Breandán Delap, Donal Lynch, Eoin O'Malley, G-spóireacht, Garret Fitzgerad, Irish Times, na Glasaigh, nós*, Nuacht 24. Faoiseamh de dhith tar éis na deireadh seachtaine…. Deireadh seachtaine saoire bainc mo thóin! Bhí an deireadh seachtaine díreach caite an ghnóthach anseo i gCúil Aodha agus muintir na h-áíte go dícheallach ag ullmhú le h-imeachtaí éagsúla. Faoiseamh atá i gceist le tús na seachtaine úire. Faoiseamh agus pleisiúr atá i gceist nuair a fhoilsítear an eagrán is déanaí de Nuacht 24, príomh nuachtán náisiúnta agus idirnáisiúnta na Gaeilge, agus nuair a chuirtear in iúl don phobal an méid sin leis an teachtaireacht úd ar An Druma Mór. Ní túisce go mbionn an eagrán is déanaí ar mo scaileán ná go mbím ag súil go mór leis an gcéad eagrán eile. Mar atá ráíte agam anseo roimhe, is ag Nuacht 24 atá seilbh na liathróide chomh fada agus a bhaineann sé leis an ‘gcomórtas’ atá á reachtáíl ag Foras na Gaeilge chun comharba a aimsiú ar Foinse, a lig siad leis imeacht le sruth i mí an Mheithimh. Tá Eoghan O Néill agus a cháírde chomh fada sin chun tosaigh go bhfuil sé geall le bheith ag amharc ar Chiarraí ag tabhairt greadadh nach beag do pheileadóirí Bhaile Atha Cliath ar bhrat Bhriotanach Pháirc an Chrócaigh Dé Luain. Is Corcaioch mise agus, mar sin, mothaím pian lucht peile na hArd Cathrach – cé go gcreidim go raibh sé aiféiseach go raibh talamh tirim á dhéanamh ag na trachtairí peile de ‘chosa nite’ na gCiarraíoch. Ní h-ionann an rud a ghuíonn tú ar a shon agus an rud a tharlaíonn ar pháirc na h-imeartha, tá’s agat. Ach ní chuige sin atáim. Is le moladh a thabhairt do Nuacht 24 atáim inniu – agus ní de bharr go gcuirim féin colún ar fáil go deonach don nuachtán atáim ag déanamh san. Bhíos ag léamh Nuacht 24 ar maidin agus, mar a dheinim go rialta, tosnaím le colún mo shean chara, Gearóid O Cairealláin. Bhíodh ‘Seo an rud’ ó pheann Ghearóid ina bhuaic phointe i Lá – agus is deas liom go bhfuil faobhar ar pheann Ghearóíd aris agus Nuacht 24 ar an bhfód. Bhí sé ag tagairt do na Gaeil móra le rá a bhí ag scríobh in altanna i Nuacht 24 roinnt seachtainí ó shin, ag scríobh agus na deora ag sileadh óna súl, faoi ná raibh aon nuachtán Ghaeilge ann níos mó anois go raibh Foinse á bhású ar an slí céanna is ar cuireadh Lá Nua chun báis roimhe sin. Nách dtuigeann na saoithe seo an íoróin a bhaineann le bheith ag rá a leithéid in altanna atá á fhoilsiú i Nuacht 24, an t-aon nuachtán Ghaeilge atá fagtha. Dearcadh sean fhaiseanta ar nuachtáin atá ag lucht caointe Foinse – agus ní chreidim ar feadh noiméid gur chaoin siad deor le bás Lá Nua nó níor áirigh siad an nuachtán sin ina nuachtán cheart ar chorr ar bith. Tá anailís ghéar ag Gearóid ar na bhfathanna lena dearcadh maslach, fiú más dearcadh neamh choinsiasach é, i leith Nuacht 24 agus Lá Nua. Creideann sé gur dearcadh crioch dheighilteach atá ar chúl cuid den mheoin aigne sin – ach léiríonn an dearcadh freisin an spleachas maraitheach atá ag céasadh na Gaeilge agus na nGael le tamall anuas, an spleachas tachtach seo ar an Stát. Is léir go bhfuil sé sa bhfuil ag cuid againn, nach féidir le glacadh le rud ach é bheith tite anuas chugainn mar a thitfeadh blúirín aráin ó bhórd bídh an Stáit. Ní foirfe go faofa ag an Stát is cosúil. Ar ndóigh má tá an Stát ag seachaint na dualgaisí atá air – agus má tá dream eile go neamhspleach ag seasamh sa bhearna agus ag déanamh na h-oibre sin – ba cheart duínn bheith buioch agus ag áireamh na mbeannachtaí. Agus chun riar a dhéanamh ar an gcur chuige craiceáílte sin, tá Foras na Gaeilge ag reachtáíl comórtais chun nuachtán nua a fhoilsiú. A leithéid d’amaidí. Is aimsir na h-eigeandála é seo – ba cheart don bhForas a rá, ós ard, go bhfuil siad ag tabhairt urraíochta do Nuacht 24 arbh fhiú €100.000 sa bhliain é abraimís agus nach bhfuil siad chun leanúint leis an gcomórtas craiceáilte seo. Ní gá comórtas poiblí a reachtáil ar son urraíochta – thug siad urraíocht €65,000 don Sunday Independent chun dluth dhioscaí maidir le foghlaim na Gaeilge a scaipeadh agus ní raibh comortas ann chuige sin. Níor cheart go mbeadh ar Nuacht 24 aon athrú a dhéanamh ar an módh scaipeachán – ach b’fhéidir go gcuideodh seo leo daoine a íoc – agus nílim ag caint orm féin nó ní ghlacfaidh mise pingin as mo cholún – mar is ceart. Bheadh sé seo ina shocrú eatramhach go dtí go mbeadh Nuacht 24 – agus ní aon ‘carpetbagger’ eile – in ann socrú ceart a dhéanamh leis an bhForas nó cibé dream a thagann i gcomharbacht ar an bhForas chun nuacht sheirbhís atá maoinithe mar is ceart a chur ar fáil. Tá ré nua breactha don Ghaeilge agus don Ghaeltacht le foilsiú tuairisc McCarthy. Tá na baincéirí agus na forbróirí is na polaiteoirí a thug go dtí an poll ifrinn seo sinn ag suí go te agus taimíd go léir ceaptha le h-ioc as a bhfeall agus a bhfaillí. Tá modhanna nua oibre ag teastáil chun torthaí nua fónta a bhaint amach. Má leanaimíd lena sean módhanna, ná bíodh íontas orainn má bhionn na torthaí tubaisteacha céanna ar an saothar. Foilsiú: 04/08/2009 . igaeilge a d’fhoilsigh. Ranganna: An Ghaeilge, Cúrsaí Reatha. Clibeanna: An Bórd Snip Nua, Foinse, Foras na Gaeilge, Gearóid Ó Cairealláín, Lá Nua, NAMA, Nuacht 24.